With a stay at Quality Inn & Suites North Myrtle Beach, you'll be centrally located in North Myrtle Beach, within a 15-minute drive of Barefoot Landing and Cherry Grove Pier. This hotel is 5.8 mi (9.4 km) from Alabama Theatre and 5.9 mi (9.4 km) from House of Blues Myrtle Beach. Make yourself at home in one of the 75 air-conditioned rooms featuring refrigerators and microwaves. Complimentary wireless Internet access keeps you connected, and satellite programming is available for your entertainment. Private bathrooms with shower/tub combinations feature complimentary toiletries and hair dryers. Conveniences include desks and complimentary newspapers, as well as phones with free local calls. Take advantage of recreation opportunities such as a seasonal outdoor pool, or other amenities including complimentary wireless Internet access and gift shops/newsstands. A complimentary buffet breakfast is served daily from 6:30 AM to 9:30 AM. Featured amenities include complimentary newspapers in the lobby, a 24-hour front desk, and a safe deposit box at the front desk. Free self parking is available onsite. 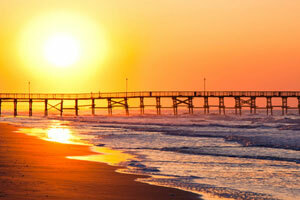 The preferred airport for Quality Inn & Suites North Myrtle Beach is Myrtle Beach, SC (MYR). Often quieter and more laid back than the bustling Myrtle Beach, this separate town boasts miles of beaches, nature trails, and its own historic Main Street.